Cous cous is typically served as a hot, pasta dish. This tiny pasta is perfect for cooling and serving in salad form. With the addition of olives, cucumber and grape tomatoes, the nutritional benefits of a healthy Mediterranean Cous Cous Salad shoots through the roof. Cook cous cous per box instructions. Fluff cooked cous cous and place in a large bowl. After the cous cous is cooled, add grape tomatoes, cucumber and olives. In a separate bowl, mix sugar, balsamic vinegar and olive oil to create vinaigrette. 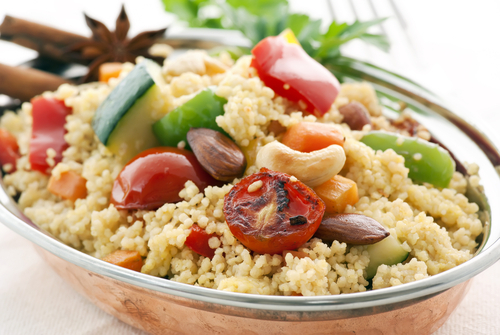 Toss the cous cous with vinaigrette until all grains are coated and tomatoes, cucumber and olives are mix thoroughly.